Possessing an electrical charge, drawn to the walls of the intestines. Highly bio-available angstrom sized ions in an aqueous solution. Mineralife Minerals are All Natural and contain NO sugars, starch, yeast, artificial flavors, colors, preservatives or animal by-products. Mineralife minerals are also free from many common allergens including dairy, wheat, yeast, gluten, dicalcium phosphate, corn, and fillers. We use the finest ingredients known to us in the production of our unique formulas. Mineralife ionic minerals; simple natural chemistry, supported by medical science, and made available through technology. Mineralife Minerals are not watered down. Mineralife Minerals are the highest quality liquid minerals on the market. Mineralife Minerals are uniquely formulated to maximize bio-availability. Mineralife Minerals are vegetarian friendly. They are 100% VEGAN. Mineralife Minerals are subjected to rigorous quality control measures and are manufactured under FDA cGMP regulations. 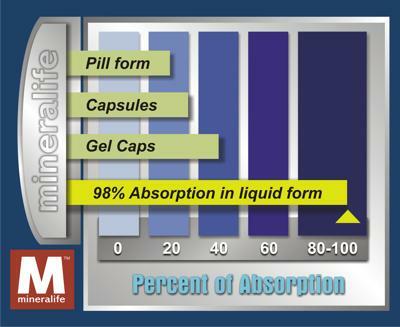 Mineralife Minerals ARE SIMPLY THE BEST CHOICE when it comes to liquid mineral supplementation! Minerals provide much of the basic foundation from which health is built and maintained, and mineral supplementation is an obvious choice for people who are interested in being proactive about their health. Ultimately, Mineralife minerals help restore and enhance the body's natural functions for healing, improving energy production, mental focus, sleep, recovery rate, and bolstering the immune system. As pointed out in the June 2002 edition of the Journal of the American Medical Association, everyone needs to supplement with extra nutrients beyond those found in their daily diets. It's a question of absorption AND form! FACT: As stated in the Journal of Chiropractic Economics (March 1998), 250,000 pounds of undigested mineral and vitamin tablets and pills are pulled out of the city sewage filters every 6 weeks in Seattle, WA. For the body to effectively use a mineral supplement, they must be in the correct form. Water or H2O, consists of two hydrogen atoms attached to one oxygen. We can breathe both hydrogen and oxygen, yet we cannot breathe water. Form is vitally important! Likewise, Calcium carbonate, a commonly used calcium supplement is not calcium. Calcium carbonate is a chemical compound containing calcium attached to a carbon and three oxygen atoms. It is the non-soluble ROCK known as limestone or chalk. A mineral supplement should contain already ionized minerals, the form which the body can selectively absorb and utilize. Since it is well accepted and understood that the first things to be absorbed in the human body are water and alcohol, water soluble minerals make sense. The ionic minerals found in Mineralife products are all less than 0.1 Nanometer in size, and can be expressed in Angstroms. These angstrom-sized ions, being completely water soluble, allow the minerals to be quickly and near 100% absorbed in either the mouth (sublingually) or in the upper stomach where lower stomach acids will not destroy them. They are also electron enhanced so that they can participate in cellular reactions. In other words, the minerals get to work right away within the human body. Just how big are 'ANGSTROM' particles? Ionic Minerals are meticulously prepared from a pure (up to 99.99% pure) elemental source in the purest energy enhanced structured water (a multi- step purification and energizing process) called MET-Water? (Magnetic Enhancement Water). Mineralife, through a complex proprietary process, liquefies minerals to a state where if dehydrated will grow crystals yielding a highly bio-available form of mineral that is non-metallic and is in simple, angstrom sized ionic form. The ionic charge is opposite of the charge of the intestinal walls, which allows the minerals to be automatically drawn to the walls of the intestines, where, because of their minute size, they are readily absorbed at a near 100% absorption rate. Mineralife's process closely resembles the dynamic and intricate functions of nature. This produces a mineral nutrition delivery-system in line with nature's own design. Because these water-soluble minerals are not necessarily dependent on the digestive tract of the body for complete absorption, they work exceptionally well for people with compromised digestive systems. They are also easier for children and older people to swallow than pills or capsules. The extremely small particle size provides a means for the mineral to leave the body if it is not needed at the time, lowering any risk of toxic buildup occurring. Mineralife can supply you with liquid ionic angstrom-sized electrically charged minerals such as boron, calcium, chromium, cobalt, copper, germanium, iodine, iron, magnesium, manganese, molybdenum, potassium, selenium, silver, vanadium, & zinc. According to Dr. Pauling and others, all diseases and disorders can be controlled, if not eliminated, by giving the body the nutrition it needs to fight and overcome imbalances. It's your health; it's your choice - choose wisely!